Warning: this post is about tabletop roleplaying games. Sorry if it makes no sense to you. 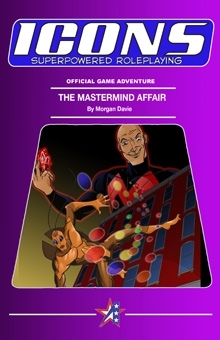 It’s a hefty 45-page adventure suitable for most traditional-type Supers RPG settings – I guess it’s a bit more DC than Marvel in its shadings. It has a whole mess of villains, all with that great Dan Houser art – you can see some of them in the preview pages. It has a descriptive character aspect of which I’m inordinately proud, but I can’t tell anyone what it is because it’s a minor spoiler. It’s a neat adventure and if you like Supers stuff, you’ll get a kick out of this. Best of all: it is only a buck ninety-nine, American. The publisher, Adamant Entertainment, has adopted an “app-pricing” model where everything costs just under US$2. This means you can get ICONS itself, the amazing full RPG game, for $1.99 as well. (Also my older stuff for the same price.) It’s a fascinating and exciting business move, and I think it’s the way all digital products will inevitably go – music downloads, e-books, online newspaper subscriptions, etc will all be getting massively cheaper as it sinks in that the value proposition is different to that of a physical product. So, $1.99 for a fun adventure. That’s about $2.60 in NZ pesos. If you are of gaming ilk, do consider it. Posted by morgue on Tuesday, February 1, 2011, at 12:04 am. Filed under Self-ish, Writing. Tagged role-playing games, self-promotion, Writing. Follow any responses to this post with its comments RSS feed. Both comments and trackbacks are currently closed. I haven’t finished reading Icons, but I do credit it for certainly helping my “supers binge” while writing The Ministry. And I was seriously considering running an Icons game at Kapcon (before I lost all enthusiasm). I now have this. I have contacted my old team and suggested that we play it.